Of and by We The People! Independent "Indy" News! Green Artisan Communities and Music Culture! Please Support Indy Media! The watch night service in 1862 was celebrated by enslaved and free African Americans, abolitionists, and others awaiting news that the Emancipation Proclamation would become law to free Blacks living in the South. The national Watch Night Service in 2018 will bring together people of conscience to recommit ourselves to the fight against systemic racism, poverty, the war economy/militarism, ecological devastation and our nation's distorted moral narrative in 2019. We will hear from Rev. Dr. William J. Barber, II and Rev. Dr. Liz Theoharis as well as North Carolinians who understand why we must build a movement to end systemic racism, poverty, the war economy/militarism, ecological devastation and our nation's distorted moral narrative. All are welcome! to Fight Climate Crisis ~ Democracy Now! Moral witnesses taken by border patrol! 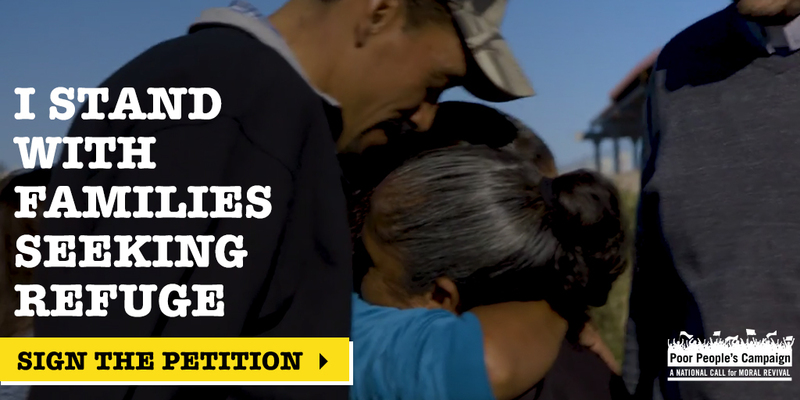 Today, the Poor People's Campaign: A National Call for Moral Revival, the Kairos Center and Repairers of the Breach answer the call from the California Poor People's Campaign and the American Friends Service Committee to join faith leaders at the U.S.-Mexico border. Together, we demand a clear and just immigration system that prioritizes family reunification and the demilitarization of our communities on the border and the interior. The startling heartlessness with which our immigration system treats migrants is a rejection of human dignity. As we watch these families walking everyday closer, we see the same faces as those in our domestic refugee crisis from homeless encampments in Chico to the wildfires throughout Northern California. The haze of tear gas choking migrant children goes hand in hand with the armored cars deployed in Ferguson, Missouri. We have a moral obligation to uphold our nation’s promise to welcome the tired, the poor, the huddled masses yearning to breathe free. We cannot succumb to hateful rhetoric and conspiracy theories. Now, more than ever, we must stand for all those with whom we share a common suffering and hope. We’re here today at the San Diego border to demand the demilitarization of our border communities and an immigration system that recognizes the shared humanity of migrants seeking safety and refuge. But we can’t do this without you: Share our petition now to support the movement, wherever you are, and demand Congress take action. Somebody has been hurting our people and it’s gone on far too long. And we won’t be silent anymore. 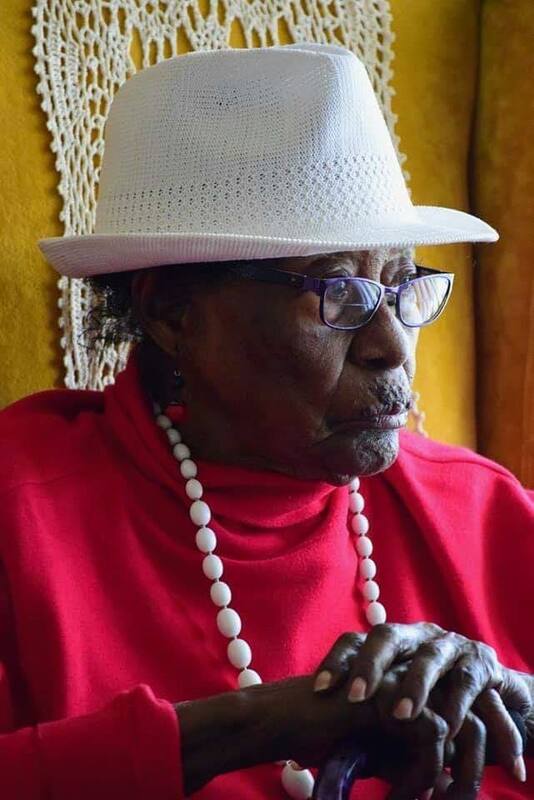 Ms. Rosa Nell Eaton was the 97-year-old Matriarch in our four-year successful court fight against voter suppression, from 2013 to 2016. While alive she stayed focused on the prize of justice for all. She once told me, "They think I'm gonna die before this case is over, but I'm not gonna die. I'm fed up and fired up!" In her 90s Mother Eaton was arrested and taken to jail. She marched in the streets and testified in the courts, and she even told Gen Eric Holder to tell his lawyers not to play with our case but to fight back. I think it's ironic that near the same week Mother goes home fro her eternal reward, Thom Farr, who led the case that threatened to take her voting rights, is denied entry onto the Federal Court. FIGHT INJUSTICE, INEQUALITY AND ENTRENCHED RACISM. Green New Deal Protests in D.C.
Sunrise is a movement to stop climate change and create millions of good [green] jobs in the process. It’s working. Our generation is turning the tide of history. Let me explain. A month ago, no one was talking about the Green New Deal. Nancy Pelosi was preparing to resurrect a failed climate committee from a decade ago. We marched into her office and joined with Rep.-elect Ocasio-Cortez to demand a Select Committee for a Green New Deal. In only three weeks, 22 Congressional Democrats signed on. Then, just this morning, 1,000 of us went back to offices of the Democratic leadership. 143 were arrested. The New York Times, NBC, CBS, the Washington Post, the AP, and dozens of other outlets covered our challenge to Democratic leaders. And we saw our pressure working. One of the most powerful Democrats in the House, Rep. Jim McGovern, stepped out of his office to declare his commitment to forming the Select Committee for the Green New Deal. As news of our protest spread, four more Representatives - Barbara Lee, Peter Welch, and Eleanor Holmes Norton, and Steve Cohen - also committed to supporting the Select Committee. These are huge wins. But nothing is certain until the rest of Democratic leadership - especially Nancy Pelosi - approves the Select Committee. We’re going to mobilize every resource and every volunteer we can to get this done before Congress breaks for winter recess this Thursday. We’ve got 3 more days to win this and guarantee the Green New Deal makes it onto the 2019 Congressional agenda. In the next three days, Democrats will finalize their 2019 agenda and leave D.C for the holidays. What they do between now and then will determine whether we get a Select Committee for a Green New Deal with mandate to draft the most ambitious climate legislation ever. Today’s action - and the new allies we’ve won in the Democratic caucus - have brought us closer to victory than ever before. But too many people in the Democratic establishment are still too comfortable delaying action, accepting money from fossil fuel executives, and condemning our generation to catastrophe. But we have a growing movement of young people from across the country, and that could make all the difference. We need to train new leaders, expand our phonebanking and digital tools, and ramp up our lobbying efforts as fast as possible. It gives me so much to see our leaders and our country discuss a plan that actually matches the scale and urgency of the crisis. It’s hard to believe how quickly our campaign for a Green New Deal got into the national spotlight. And if the headlines from today tell us anything, the Green New Deal is going to be a big priority for Democrats in the upcoming Presidential primary. We’re going to make sure this plan develops into the legislation we need. Thank you for everything you do in this movement. Sign up here to get updates from Sunrise. at the US-Mexico border. Join us in a solidarity event near you! is seriously challenging the political and economic order in France. An autocratic president without a party or a mandate. A desperate lower-class population angry over growing economic inequality in a rich country and government indifference to their plight calling for Macron to resign. A class of organized civil servants and unionized workers still licking their wounds and paying their bills after failing to block the president’s counter-reforms last spring. Traditional parties — left (socialists, etc.) and right (Gaullists etc.) — that have alternated in power since the end of World War II diminished and eclipsed. The parties of the far left (Jean-Luc Mélenchon supporters, various Trotskyists, etc.) and the far Right (the former-National Front) are too preoccupied with internal fights to play any significant role. Powerful mass media dominated by the interests of big business but viewed with suspicion by more and more of the population. A brand-new “leaderless” mass movement connected by social media, “finding its way by walking,” more or less consciously embedded in a long history of French rebellions and struggle, discovering its natural leaders (“good thinkers, good talkers” like old Guillaume Carle), putting forth its own ideas for the reorganization of society. Cancel the interest on illegitimate debt. Don’t tax the poor to pay it back, find the 85 billion Euros of fiscal fraud uncollected. Privilege city and village centers. Stop building huge shopping centers. Big companies like McDonald’s, Google, Amazon and Carrefour should pay big taxes and little artisans low taxes. We all need healthcare, and less and less of us can afford it. The Poor People’s Campaign: A National Call for Moral Revival is postponing our December 5, 2018, press conference in Washington D.C.
NO SOUND for 30 or so mins then Nothing! our voting rights and address the voter suppression across the country. to vote to all current and formerly incarcerated people. Mississippi D. C. Senate Voting! Craft a Sunday service around Indigenous Peoples Day. As you plan your service, invite those within your congregation who are Native people to participate in the planning and the service itself. Work to find out the pre- and postcolonial history of the land you are worshiping on and the Native peoples who have lived there. Build and strengthen connections to nearby Native communities. Make plans to attend an event hosted by a Native group, organization, or cultural center. Find out how your congregation can be of assistance regarding the issues nearby groups are working on or struggling with. Study the Doctrine of Discovery and work to eliminate its effects. At the 2012 General Assembly, Unitarian Universalists passed a resolution repudiating the Doctrine of Discovery and calling for study of the doctrine and elimination of its presence from the current-day policies, programs, theologies, and structures of Unitarian Universalism. Study and discuss the Doctrine of Discovery in your congregation and take action on the 2012 resolution. Take action to rename Columbus Day “Indigenous Peoples Day”. South Dakota, Alabama, and Hawaii have renamed Columbus Day. Other states (New Mexico, for one) have come close. Use the web to discover if anyone has tried to change the holiday in your city or state, and form a congregational task force to start or join the movement. Check out Denver’s Transform Columbus Day Alliance for more info and resources. Provide age-appropriate education on Native lives and cultures as part of your congregation’s religious education programming. Take active steps to counter the dominant message that Native peoples are history by offering examples of present-day American Indian life, art, etc. Check out the books Through Indian Eyes and A Broken Flute. Go further by creating a task force to find out what your children learn about Columbus in school. You can use Lies My Teacher Told Me and Rethinking Columbus to evaluate textbooks and offer suggestions. Hold a movie screening with a discussion afterward. There are a plethora of films that can generate rich discussion. Check out VisionMaker Video, a video catalog by Native American Public Telecommunications of films by and about Native folks (see, for example, the film Columbus Day Legacy). Host a congregation-wide common read and book discussion. Possible titles include An Indigenous Peoples' History of the United States by Roxanne Dunbar-Ortiz, A Little Matter of Genocide by Ward Churchill, Off the Reservation by Paula Gunn Allen, Bury My Heart at Wounded Knee by Dee Brown, Reinventing the Enemy's Language edited by Joy Harjo and Gloria Bird, The Woman Who Watches Over the World by Linda Hogan, and Soul Work edited by Marjorie Bowens-Wheatley and Nancy Palmer Jones. Support Native booksellers such as the North American Native Authors Catalog. You can also find books on the particular tribes in your area—check out this listing of books by tribe from Native Languages of the Americas. For more reading suggestions, visit Bringing the Doctrine of Discovery Back Home. Engage with “Immigration as a Moral Issue.” Indigenous peoples of Central America are a big part of today’s desperate wave of migration to the United States. Find out how the United States has continued Columbus’s violent legacy of colonialism against Central American peoples. Check out the study guide from Multicultural Growth & Witness. Begin Building the World We Dream About, a transformational Tapestry of Faith curriculum on race and ethnicity. This program allows participants to take concrete steps to heal, individually and as a congregation, the ways in which racism separates us from one another and spiritually stifles each of us. Take action for the rights and needs of Native peoples! WASHINGTON—U.S. House Democrats must use their new – and growing – majority in the next Congress to act on restoring voting rights and to investigate and expose a variety of ills besetting the country, the Rev. William Barber says. Barber, co-leader of the New Poor People’s Campaign and founder of the Moral Mondays movement which has spread to other states from his native North Carolina, issued the challenge as part of his keynote and closing address at a Nov. 15 Economic Policy Institute awards ceremony. 129 million dead trees have also fueled the state's wildfires. It would be completely understandable if the people of Butte County wanted to let Thursday pass without a single thought about Thanksgiving. The death toll of the Camp Fire stands at 81. Nearly 870 people are still unaccounted for. Tens of thousands are without homes. Jobs and schools and businesses have been lost. Yet Kelly Laflamme, a resident of Paradise — the town of 27,000 destroyed by the fire — told USA Today she has found something to be thankful for: overwhelming examples of human kindness. Laflamme will offer her own act of kindness by helping to serve at project Thanksgiving Together. The goal of the project, led by chef Jose Andres’ World Central Kitchen, is to serve 15,000 meals in four shifts at three large Chico locations and in Red Cross shelters. "We've been working really hard to make this happen," city of Paradise mutual aid spokeswoman Briana Khan told the Record Spotlight. "We had an idea that it would be great to bring the community together so they can share in fellowship on Thanksgiving." The hosts are World Central Kitchen, the city of Paradise, Chico State University and its Associated Students, and the Sierra Nevada Brewing Co. The brewery expects to serve about 1,600 people. It's preparing 1,500 pounds of turkey, 1,200 pounds of pulled pork, mashed potatoes, green beans, and gravy. "Our owner realized that if we cooked the potatoes in our brew kettle (where we make beer), we could do about 1,000 pounds of mashed potatoes at a time," said Robin Gregory, a spokeswoman for the brewery. "So we are indeed cooking mashed potatoes in the brew kettle." WKC is accepting donations of $5 and more online to help offset costs. Previously, WKC delivered more than 140,000 meals to shelters in North Carolina after Hurricane Florence. It also served more than 3.6 million meals in Puerto Rico after Hurricane Maria. Lincoln, California, is about 90 miles south of Paradise, but that hasn't stopped residents from wholeheartedly stepping in to help fire victims and first responders. Dozens of the town's residents will give up Thanksgiving with families to serve a meal to about 300 people. "We have over 100 (volunteers), we're probably close to 150 turkeys that people are cooking. We aren't having to cook anything," organizer Kris Wyatt told Fox40. "Everybody is bringing all the food prepared." The meal is being served at the community's McBean Pavilion to families staying at nearby hotels after being forced out of their homes by the fire. “So exciting and so wonderful that it's kind of hard not to tear up anymore because it's truly the community coming together and helping,” Wyatt said. A couple in Rocklin, California, wanted a more immediate way of making an impact, so they decided to "adopt a family" that was a victim of the fire. "I can't help thousands of people but I can help one family,” Eric Lofholm told Fox40. Lofholm and his wife, Heather Lofholm, helped one family and launched a Facebook group and a website so that others could help, too. "I think a lot of people right now, they go, 'I want to help but I’m not sure what to do,'" Lofholm said. "One thing you can do is just help one family." The Facebook group had grown to more than 14,000 members on Wednesday. The Lofholms drive to Butte County to help sign up victims who have no way to reach the page. Aaron Rodgers, quarterback of the Green Bay Packers and a native of Chico, California, is donating $1 million to relief efforts. In a video on Twitter, Rodgers said the money will go to the North Valley Community Foundation. He also said his corporate partner, State Farm, will donate $1 for every retweet of his post that uses the hashtag #retweet4good, up to $1 million. "Raising money for both immediate needs and the long-term recovery is what is needed most right now,” Rodgers said in the video. The North Valley Community Foundation said in addition to meeting basic needs, the money will be used for housing, kids programs, and youth and high school sports. The Butte County Emergency Operations Center reinforced that monetary donations are the best way to help the most people. It said it has run out of space for donated items. Rain falling Wednesday helped the crews fighting the wildfire. But it could also raise the risk of flash floods, complicate efforts to recover remains and make life even more difficult for people who have nowhere to go. Heavier rain was expected later in the day in the Paradise burn area, where the Camp Fire has killed at least 81 people and destroyed more than 13,000 homes. The Camp Fire started on Nov. 8 has burned nearly 239 square miles, destroying nearly 13,000 homes and over 3,800 other structures. The fire is about 80 percent contained. Southern California's huge wildfire briefly flared back to life Wednesday as residents put sandbags around properties ahead of a rainstorm that authorities said could bring the risk of mudflows and rockslides from denuded hills and mountains. A hotspot ignited in a remote area of Bell Canyon west of Los Angeles, Ventura County fire Capt. A.J. Lester said. No structures were threatened by the flare-up, which was quickly knocked down by two engine crews. With the burn assessment complete, authorities tallied 1,643 buildings destroyed and 364 damaged. Only six other California wildfires have destroyed more structures, according to state statistics. Three deaths were confirmed in the Woolsey Fire in Southern California, bringing the statewide total to 82. The predicted rain was expected to fall not only on the Woolsey Fire burn area but on other scorched parts of Southern California, including the burn scar of the Hill Fire, which also erupted on Nov. 8 in Ventura County but was held to about 7 square miles. The San Francisco Chronicle reports that PG&E in a recent regulatory filing said California officials are investigating a second area where the utility company's equipment failed about the same time the Camp Fire broke out. The energy company told state regulators Friday that it had an outage about 6:45 a.m. Nov. 8 at the 12-kilovolt Big Bend 1101 Circuit in Concow. That's roughly 15 minutes after authorities say the Camp Fire started burning east of Paradise. Earlier, PG&E filed a report with the California Public Utilities Commission saying another transmission line malfunctioned about 15 minutes before the fire began near the same spot that fire officials identified as the fire’s origin point. According to the Chronicle, the state's Department of Forestry and Fire Protection has since said it is examining a possible second origin point for the Camp Fire. A spokeswoman for the utility declined to comment beyond the regulatory filing. A Cal Fire spokesman told the newspaper the Camp Fire’s cause is still being investigated and declined to comment further. Lawsuits have already been filed in San Francisco and Butte County courts claiming PG&E had a connection to the Camp Fire. Victims of the Woolsey Fire have sued Southern California Edison, alleging the utility was negligent in failing to shut off power before the blaze started. Plaintiffs' attorneys said Tuesday that nearly 20 people are part of the class-action lawsuit filed last week in Los Angeles Superior Court. The court filing accuses Edison of contributing to the fire's destruction by ignoring warnings of extreme fire weather. The lawsuit says the utility only shut power off once the fire started. Edison says a statement it can't comment on litigation related to wildfires. The cause of the fire remains under investigation. As crews work tirelessly to put out the Camp Fire, Californians can't rest easy. The state can expect more deadly wildfires that spread incredibly fast. That's because years of drought and bark beetle infestations have killed more than 129 million trees, Vox reported. All that dead timber is just waiting for a spark to ignite it. That spark is much more likely with more and more people living so close to the forests. Plus, climate change is causing the vegetation around the trees, like grasses, to dry up and provide even more fuel for the fires. Vox explained that the solution isn't as easy as cutting down the dead trees. Many of the forests extend over federal, state and private lands — creating a jurisdictional mess. Many of the trees are too decayed to be used by lumber companies, so there's no profit in cutting them. Coming up with a forest management plan that all parties can agree to is likely impossible. As Umair Irfan of Vox wrote, "Politically, it’s easier to muster the resources to put out a fire than it is to prevent one." We jam the corporate behemoths that have a stranglehold on our attention, time, and thoughts—Alphabet (Google), Apple, Facebook, Amazon. These mega corps monetize our likes and clicks, feeding our personal information into endless algorithms that exacerbate our addiction to the instant gratification they provide. They claim to connect us, yet a crisis of loneliness pervades our culture like never before. Whatever it takes to make Silicon Valley do a double take. Spread the word; let's shake loose the grip Big Tech has on our minds—even just for one day—to feel the power the people are capable of and rethink the way we let technology run our lives. Let's flip the power balance. Let's make the internet ours again. Build Community With a New and Unsettling Force and Rev. Barber: Did you know that while the U.S. economy has grown 18-fold in the past 50 years, wealth inequality has expanded, the costs of living have increased, and social programs have been restructured and cut dramatically? The truth is that economic insecurity, poverty and misery are affecting more young people in 2018 than we are made aware. Join Reverend Barber, a new and unsettling force, and other speakers to build community around challenging the evils of systemic racism, poverty, the war economy, ecological devastation and the nation’s distorted morality. An Ecological Justice Moral Monday with Rev. Dr. William J. Barber, II and Former Vice-President Al Gore: Presented by the North Carolina Poor People's Campaign: A National Call for Moral Revival, an important Ecological Justice Moral Monday in Greensboro where North Carolinians impacted by ecological injustice in their communities share their stories. The Rev. Dr. William J. Barber, II, Former Vice President Al Gore, and Karenna Gore will join to help offer solutions for radical change that can help create safe and healthy communities in North Carolina and across the country. Rev. Barber ?Censored by C-SPAN? shows up for the Keynote Address and the feed is CUT! July 31, 2018** ~ Democracy Now! July 30, 2018** ~ Democracy Now! July 27, 2018** ~ Democracy Now! Nicolás Maduro Moros in Valenzuela! Over Thirty State Capitols that are Rockin'-N-Reelin'! Beautiful Human Beings were gunned-down murdered. No video to be found, yet! a turn toward the Hawaiian islands later this week. Hint! For fb avoiders like myself: As fast as you can: Open link**. Click start arrow and "full screen". New York Avenue Presbyterian Church - a lively 05/06 Sunday! an assassin snatched his life on April 4th." and beta ray emissions from (mostly*) natural sources. Counts Per Minute (CPM) averages are with "pancake"
Readings - "What You see is what you get." dozens of others). (Also heavier elements like Plutonium 239). ^"One Becquerel" is one disintegration per second = "1 Bq". Darkened circles show increasing trend. nuclear fission product). This tuning sees across only a relatively narrow energy spectrum. with Cs 137! Take precautions! that the contamination from the Fukushima three 100% meltdowns would dilute. guarded and prevented from leaking radioactivity for at least a millennium. Looking at Rome and Greece, today? Hardly! Try a hundred times longer! camouflaged with a facade building. Going to the 2020 Games? Bring a Geiger! cover-up has been, so far, airtight. But an "Ed Snowden" or "Chelsea Manning"
and true assessment to whether it is safe in Japan.